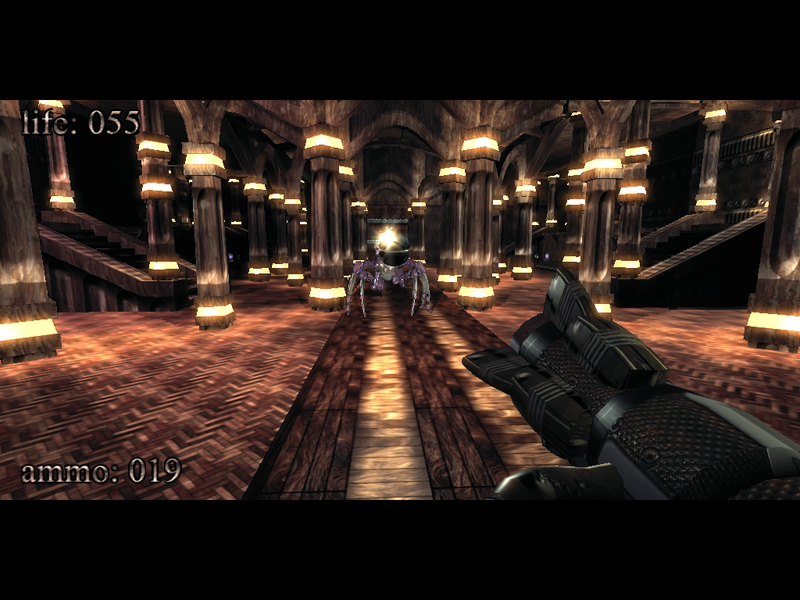 Kkrieger is a portable first-person shooter in a single 95KB executable. The program was written in 2004, and despite its tiny size, it looks and feels much like similar games of the day. You must run around a maze of corridors to an atmospheric soundtrack, picking up guns, ammo, health packs and more, while shooting assorted monsters before they get too close. Controls are mostly keyboard-based, and also much the same as other programs: press W/ A/ S/ D to move around, space to jump, 1-5 to switch weapons, left mouse button to shoot, and Esc to pause or close a game. PLEASE NOTE: Kkrieger doesn't run smoothly with modern Windows and PCs, and there's a good chance it won't launch at all on the default settings. To run the program successfully, right-click pno0001.exe, select Troubleshoot Compatibility > Try Recommended Settings. Alternatively, create a shortcut for the program, right-click it and select Properties > Compatibility. At a minimum, check "Run this program in compatibility mode for" and select "Windows XP (Service Pack 3)". BEWARE: kkrieger needs to take full control of your hardware to run successfully, and this means running full-screen and grabbing your mouse. That's not an issue while you're playing, but if you Alt+Tab away, you might find you can't move the mouse or Alt+Tab back. To avoid problems, close kkrieger properly via the Esc menu rather than switch away, and ideally save any current work before you play the game. Kkrieger probably won't hold your interest for long as a game, but squeezing this much functionality into under 100kb is still a hugely impressive technical achievement.